GLENDALE, Calif.--(BUSINESS WIRE)--What tastes like spring and pairs absolutely perfect with Mardi Gras, St. Patrick’s Day and Spring Break celebrations? Applebee’s new $2 ABSOLUT® Rainbow Punch, of course. 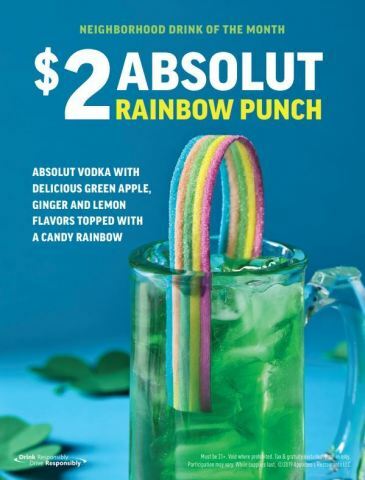 Applebee’s March Neighborhood Drink of the Month is an authentic punch made with ABSOLUT vodka and the combination of green apple, ginger and lemon flavors, topped with a rainbow gummy garnish. Served in a 10-ounce mug, you’ll find refreshing flavor at the end of this rainbow.